If you live in any of the University City Apartments in Charlotte, NC, then you probably don't have to worry about paying for a local gym membership. Here at Phillips Mallard Creek, we have all the things you need to get fit available in our apartment fitness center! The key to getting a quality workout is all about making the most of the space and equipment you have on hand. Once you learn these 8 exercise techniques, you will have no problem getting in a good workout. Plus, you can even take these tips with you when you travel, they are great for hotel fitness centers as well! 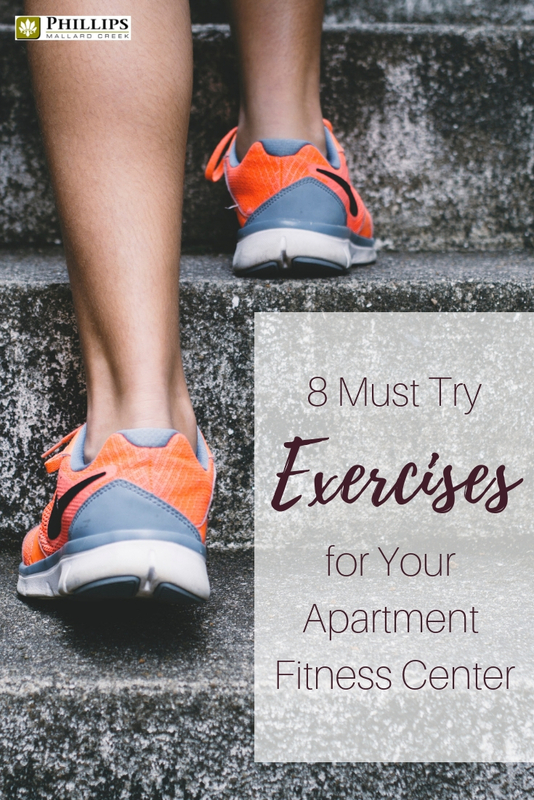 Use this guide to create your perfect workout routine in your University City apartment! It is always a good idea to start your workout with some light cardio to get the blood flowing and the muscles warmed up. Hop on a treadmill or an elliptical for five to ten minutes. You don't want the pace to be super difficult, but you want it strenuous enough to get your heart rate up and your lungs warm and open. A burpee, also called a squat thrust, utilizes your entire body which makes it an excellent workout move. You have probably done this before either in a strength training class or in an aerobics class. It is a four-step move. You start in a standing position with your hands raised straight up above your head. Then you move down into a deep squat with your hands on the ground, shoulder width apart. Step three involves kicking your feet back behind you until you are in plank position. Finally, you hop your feet forward back into your squat and stand up, step four should be done in one fluid movement. A superset is when you do two different exercises back-to-back without taking any rest time in between. For instance, you can do a set of ten chest pulls on the machine and then immediately do a set of pushups on the mat. You take a small rest in before you go back to your pulls. Supersets are great because they really keep your heart rate up which helps you burn more fat during your workout. The Lat Pulldown is a good exercise for strength training, and it targets the latissimus dorsi muscle. You will sit at the weight machine using the brace on your thighs. Sit up tall with a straight back and keep your feet firmly planted on the floor. You will grip the bar with your arms wide on either end of the bar, and then you pull the bar in a controlled manner towards your sternum. There are many variations for the lat pulldown, most involve changing the position of your hands. You can explore all the various methods until you find the one that feels best for you. This exercise involves pushing the weight using the strength of your legs. You will need the leg press machine to complete this exercise. You want to adjust the bench so that your legs and your torso can be at a 90-degree angle for your starting position. On an inhale, allow the platform to lower until the top of your legs and your calves are at a 90-degree angle. Using the heels of your feet, push the platform away from you until you are back in your starting position. For this exercise, you will need a box or a step. It can be done using only your body weight, or you can use dumbbells to give yourself extra resistance. You will place your toes on the box or step with your heels either resting on the floor or hovering just above it. Then, using your calf muscles, bring yourself up to your tiptoes. Head to the bicep curl machine to get some work done on your arms. You will need to adjust the seat until it is at an appropriate and comfortable height for you. Your upper arms will be placed on the pads so that you can grasp the handles. You will then pull the handles towards your body, flexing your elbow. Make sure that you use control to lower back to your starting position. The final exercise is one of everyone's favorites…the crunch. This ab workout doesn't need any equipment at all. In fact, you could do it every day without even leaving your University City apartments. While in the gym, you will probably want a mat, however. Start by lying on your back with your hands behind your head, supporting your neck. Your legs should be bent at the knee and about hip-width apart. Using only your stomach muscles, bring your upper body off of the floor, then release back in a controlled motion. There you have it! 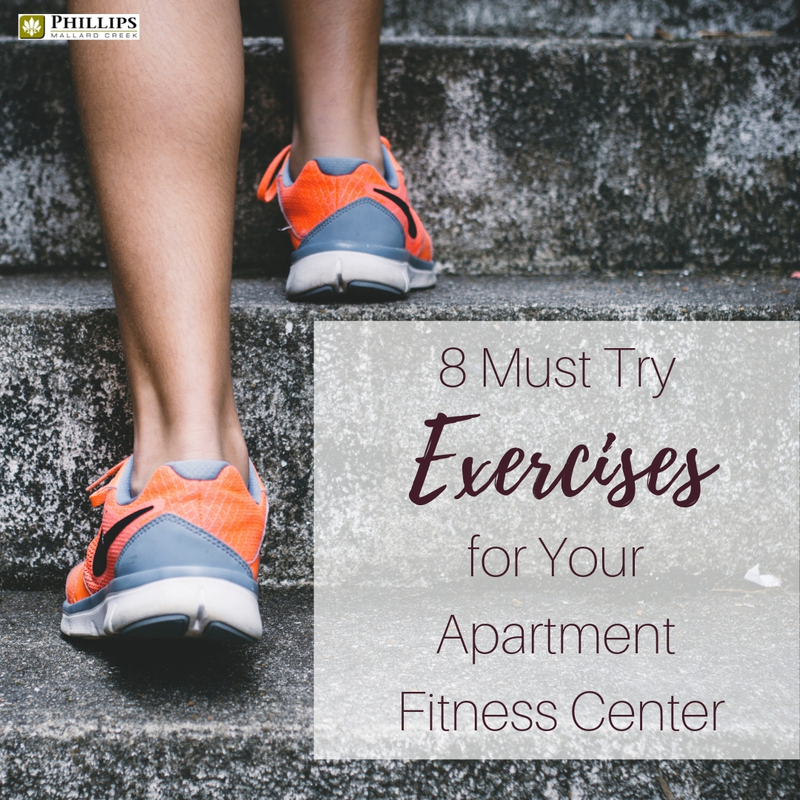 Eight simple exercises that you can do using the equipment in your Charlotte apartment's fitness center. You can create a custom routine that you can do several days per week to keep your body looking great and improve your overall health.